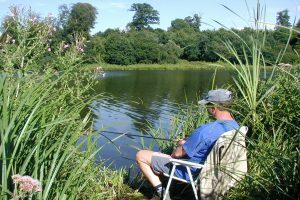 As on any other river, fishing the River Stour in Ashford requires the angler to have an up to date rod license and to abide by the close season and other regulations. See Regulations and Guidelines for more information. On private land, you also have to have the landowner’s permission in order to fish. Much of the riverside land in Ashford is owned by Ashford Borough Council and free fishing in the river is allowed by the council in these areas. See the Ashford Green Corridor page for information on council owned parks and green spaces along the river. The exception to this is where fishing rights are held by a club or society. Ashford Angling Society have rights to fishing on stretches of the river in the Willesborough/Conningbrook area – visit the Ashford Angling Society website or download this PDF below to see a map. Ashford Angling Society also hold fishing rights on Singleton Lake. In addition to the River Stour there are many lakes and other water bodies used for fishing in the Ashford area.